A baked sweet potato is a simple and delicious way to savor your favorite spud. Enjoy a pocket of sweet, caramelized goodness or mix-and-match the fillings based on your personal taste. Our Healthy Loaded Baked Sweet Potatoes are perfect little meals, the Greek yogurt packs a tangy punch that the whole family will love. If you don’t like yogurt, no worries! Stuff these delicious baked sweet potatoes with whatever you choose: grilled veggies, butter and brown sugar or a fried egg. Enjoy as a side dish or on its own as a light lunch or dinner. Line a rimmed baking sheet with foil. With a fork, pierce sweet potatoes all over and place on baking sheet; bake until tender, about 45 minutes. Meanwhile, in a medium bowl, mix yogurt with lime juice and salt. Cover and refrigerate. When sweet potatoes are done, allow to cool 10 minutes. With a small spoon, break and remove the skin from tops of the potatoes. Use a fork to gently mash the insides. 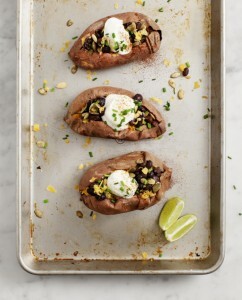 Top each sweet potato with 1/4 cup black beans, 1/4 cup yogurt mixture, 1 tablespoon pumpkin seeds, a sprinkle of chives and a dusting of chili powder.